What Generation do you fall into? Who are the generations you ask? I was born in 1988. I am proudly a Gen Y. What do you consider typical characteristics of your generation? Gen Y are open-minded and adaptable. We are living in a constantly-changing world where the Internet has made it a much smaller place. We have access to resources and technologies that our parents could not have. It has never been easier to travel and make connections with people around the world, online and offline. We embrace diversity. Vietnamese Gen Y, particularly, were born in an exciting time when our country became independent, war-free and started to open the economy. Today, we are one of Asia’s fastest-growing economies. Vietnamese Gen Y are known to be hardworking and achievement-oriented. More importantly, however, we want meaningful work and work-life balance. At the end of the day, family and friends matter to me. What do you expect from corporate leadership in today’s business world? Integrity. Leaders must represent themselves truthfully, exhibit openness in regard to corporate’s information, and treat every employee with respect. Being socially driven myself and having a background working in social development, I strongly believe that organisations can be successful and sustainable only when they are are honest to themselves, to their employees, and to the communities they are operating in. What engages you most in the workplace and what makes you go the extra mile? The sense of being part of something worthwhile and being appreciated. I’d like to receive constant feedback and feel that my ideas are valuable and that my work is meaningful. Knowing I can make positive social impacts makes me to go the extra mile. Working in education, I believe education, in any forms, empowers people. It enables people to make decisions that not only impact themselves but also others. Previously, working with a road safety NGO allowed me to reach out to one of the most vulnerable road users – children. Every time I saw a child from a project school practicing safe road behaviours, i.e wearing a helmet or crossing at the zebra crossings, I felt happy because I knew I had contributed to making his or her life safer. That is the biggest motivation for me. What is your preferred way to communicate in the workplace? Generally, I prefer face-to-face communication. It creates a sense of belonging and allows messages to be conveyed clearly given the presence of verbal and nonverbal cues. Phone calls, email, or Skype are also helpful depending on the situation. What kind of development opportunities do you expect to be offered by your employer? On-the-job mentor, peer coaching, formal training, conferences, etc. Managers should learn about employees’ values and personal goals and then incorporate them into development plans. Training should not be limited to technical aspects of the job, but should also cover soft skills and living skills that benefit employees’ physical or mental well-being. By this, I can become a well-rounded person and have the energy to be more productive work more efficiently. What do you wish your colleagues from other generations would know about Generation Y? Generation Y always looks for the “why” behind the tasks we are asked to perform, because we want meaningful and challenging work. We are not working just to pay the bills. We look for meaning and enjoyment simultaneously. We are optimistic, social and have high expectations for ourselves and others. Please complete this sentence: For me, my job is… … a balance of doing what I’m good at, feeling appreciated, and believing that it is making people’s life better. What are the priorities during this phase of your life? Finding inspiration. I don’t like routines. I constantly seek inspiration and new challenges. When I am inspired and believe in what I do, I can go the extra mile. I think everyone needs inspiration to innovate and excel at whatever they are doing. How do you balance your personal and professional life? Work-life balance is a matter of the utmost importance to me. I’m currently working as a freelancer, spending most of the time working from home. Therefore, I have more flexibility with respect to working time. Nevertheless, I try to keep set work hours and accomplish my priorities in a given schedule. When not working, I love spending time with my loved ones, traveling, or sometimes having quiet time for self-reflection. When you choose a job, what do you look for in a new challenge? Inspirational people. The people that I will be working with matter to me. I want to work a team that that inspires me, has a clear purpose, and has something I can learn from, professionally and personally. Nhu is a GenYer who is passionate about helping and developing people, both professionally and personally. 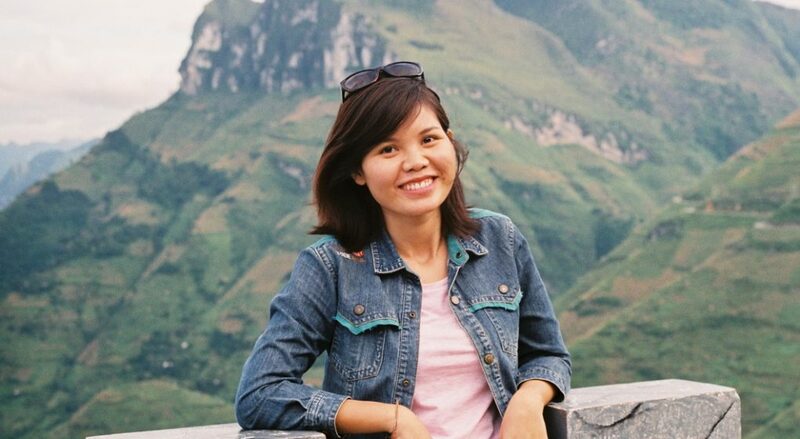 A Saigonese at heart, but her wanderlust has taken her to different corners of the world. Nevertheless, she'll always finds her way back to her cats and Saigon's ca phe sua da.